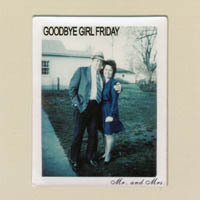 GOODBYE GIRL FRIDAY Mr. and Mrs.
Nice and smooth, indeed, Goodbye Girl Friday – consisting of David Sherman (vocals, keyboards), Dan Grennes (bass) and Andy James (drums) – is a jazz-rock combo that would seem more at home in the seventies where keys-men like Elton John and Billy Joel ruled the airwaves, than the guitar-dominated modern alternative rock and pop scene. Strongest references here are rather obvious – Steely Dan’s supple brand of the fusion of jazz and rock and even Supertramp (especially Rick Davies’ material) can be spotted now and then. Sherman’s choice of weapon is the Fender Rhodes judiciously employed with the odd smattering of organ and horns to keep things interesting. No guitars though ever come into the equation. But with such fervently delivered songs like the pleasing “A Throw Away,” vibrant “Peace Out,” suave “Summer Dusted Mind,” brooding “Once” and quirky “Big Red Bong,” you hardly notice its absence.